Synthetic ruby (also known as ruby made or developed in the lab) was created through an artificial process that usually involves high temperatures and pressure. From a chemical point of view, rubies made in the lab are no different from natural ones and are considered real rubies. It should be noted that rubies produced artificially are not the same as fake rubies, which have a different chemical structure than natural ones. Testing whether Ruby is made in a laboratory involves analyzing physical structure and chemical composition. Although synthetic and natural rubies are almost identical, there are some very subtle differences that can be detected with the appropriate equipment. Structural cues: Gemologists can find out whether rubies are synthetic by looking at their structure under a microscope. Rubies have what are called "growth lines" - structural patterns that occur during stone formation. The synthetic growth line is curved, indicating the origin of artificial Ruby stones. Laboratory-made Ruby may also have microscopic gas bubbles in it, which are formed during the manufacturing process. Chemical differences: The manufacturing process Synthetic rubies have certain chemical traces in the rock, which are not present in natural gemstones. For example, small amounts of lead can show that rubies are artificially made. Although testing stones in a laboratory is the best way to find out the origin of ruby, it is not always reliable. The process of creating gems continues to be improved, and the stones made by the lab are almost identical to their natural analogues. In 1837, Gaudin made the first synthetic Ruby by combining potak alum at high temperatures with a little chromium as pigment. In 1847, Ebelmen made white sapphire by combining alumina with boric acid. In 1877, Frenic and Freil made crystal corundums from which small stones could be cut. Frimy and Auguste Verneuil made artificial copies by combining BaF2 and Al2O3 with a little chromium with red flame. In 1903, Verneuil announced that he could produce synthetic rubies on a commercial scale using this fire fusion process. In 1910, Verneuil's laboratory had developed into a 30 furnace production facility, with annual gemstone production reaching 1,000 kilograms (2,000 lb) in 1907. Another process in which synthetic Ruby can be produced is through Czochralski withdrawal processes, flux processes, and hydrothermal processes. Most synthetic rubies come from flame fusion, because of the low costs involved. Synthetic rubies may not have imperfections seen in the naked eye but enlargement can reveal curves, striae and gas bubbles. The fewer the numbers and the less obvious their imperfections, the more valuable the rubies; Unless there are no imperfections (ie, perfect Ruby), in this case it will be suspected artificial. Dopants are added to some rubies produced so that they can be identified as synthetic, but most require gemological testing to determine their origin. Synthetic Ruby has technological uses as well as gemstones. Synthetic ruby ​​stems or glass are used to make ruby ​​lasers and masers. The first laser work was made by Theodore H. Maiman in 1960. Maiman used a patented ruby ​​solid-state synthetic to produce red laser light at a wavelength of 694 nanometers (nm). Ruby lasers are still used. Rubies are also used in applications where high hardness is needed such as in locations exposed to modern mechanical clocks, or such as scanning tip probes on coordinate measuring machines. Imitation RubY is also marketed. Red spinel, red garnet, and colored glass have been considered fake as rubies. Imitation returned to Roman times and by the 17th century a technique had been developed to dye red foil - by burning red wool on the bottom of the furnace - which was then placed under artificial stone. 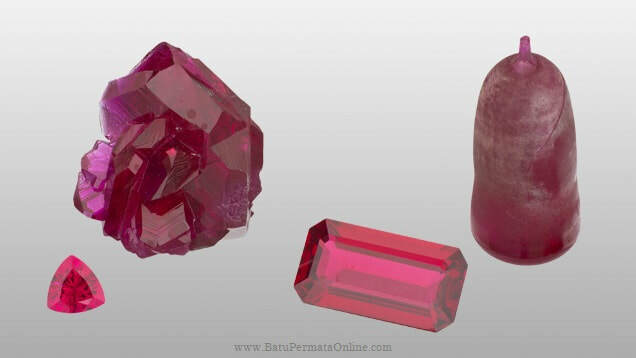 Trading terms such as reply to ruby ​​for red spinel and rubellite for red tourmaline can mislead unsuspecting buyers. Therefore, such terms are discouraged because they are used by many gemological associations such as the Laboratory Manual Harmonization Committee (LMHC).